Having discussed in Chapter 11 "Secured Transactions and Suretyship" security interests in personal property and suretyship—two of the three common types of consensual security arrangements—we turn now to the third type of consensual security arrangement, the mortgage. We also discuss briefly various forms of nonconsensual liens (see Figure 12.1 "Security Arrangements"). A mortgageSecurity in which collateral is land. is a means of securing a debt with real estate. A long time ago, the mortgage was considered an actual transfer of title, to become void if the debt was paid off. The modern view, held in most states, is that the mortgage is but a lien, giving the holder, in the event of default, the right to sell the property and repay the debt from the proceeds. The person giving the mortgage is the mortgagorOne who gives a mortgage; the debtor., or borrower. In the typical home purchase, that’s the buyer. The buyer needs to borrow to finance the purchase; in exchange for the money with which to pay the seller, the buyer “takes out a mortgage” with, say, a bank. The lender is the mortgageeThe party who holds a mortgage; the creditor (such as a bank)., the person or institution holding the mortgage, with the right to foreclose on the property if the debt is not timely paid. Although the law of real estate mortgages is different from the set of rules in Article 9 of the Uniform Commercial Code (UCC) that we examined in Chapter 11 "Secured Transactions and Suretyship", the circumstances are the same, except that the security is real estate rather than personal property (secured transactions) or the promise of another (suretyship). Statutes dealing with consumer credit transactions (as discussed in Chapter 10 "Consumer Credit Transactions") have a bearing on the mortgage, including state usury statutes, and the federal Truth in Lending Act and Equal Credit Opportunity Act. If the lender decides to grant a mortgage, the mortgagor signs two critical documents at the closing: the note and the mortgage. It is enough here to recall that in a note (really a type of IOU), the mortgagor promises to pay a specified principal sum, plus interest, by a certain date or dates. The note is the underlying obligation for which the mortgage serves as security. Without the note, the mortgagee would have an empty document, since the mortgage would secure nothing. Without a mortgage, a note is still quite valid, evidencing the debtors personal obligation. One particular provision that usually appears in both mortgages and the underlying notes is the acceleration clauseA contract clause providing that the entire amount owing in debt becomes due if one payment is missed.. This provides that if a debtor should default on any particular payment, the entire principal and interest will become due immediately at the lender’s option. Why an acceleration clause? Without it, the lender would be powerless to foreclose the entire mortgage when the mortgagor defaulted but would have to wait until the expiration of the note’s term. Although the acceleration clause is routine, it will not be enforced unless the mortgagee acts in an equitable and fair manner. The problem arises where the mortgagor’s default was the result of some unconscionable conduct of the mortgagee, such as representing to the mortgagee that she might take a sixty-day “holiday” from having to make payments. In Paul H. Cherry v. Chase Manhattan Mortgage Group (Section 12.4 "Cases"), the equitable powers of the court were invoked to prevent acceleration. Under the statute of frauds, the mortgage itself must be evidenced by some writing to be enforceable. The mortgagor will usually make certain promises and warranties to the mortgagee and state the amount and terms of the debt and the mortgagor’s duties concerning taxes, insurance, and repairs. 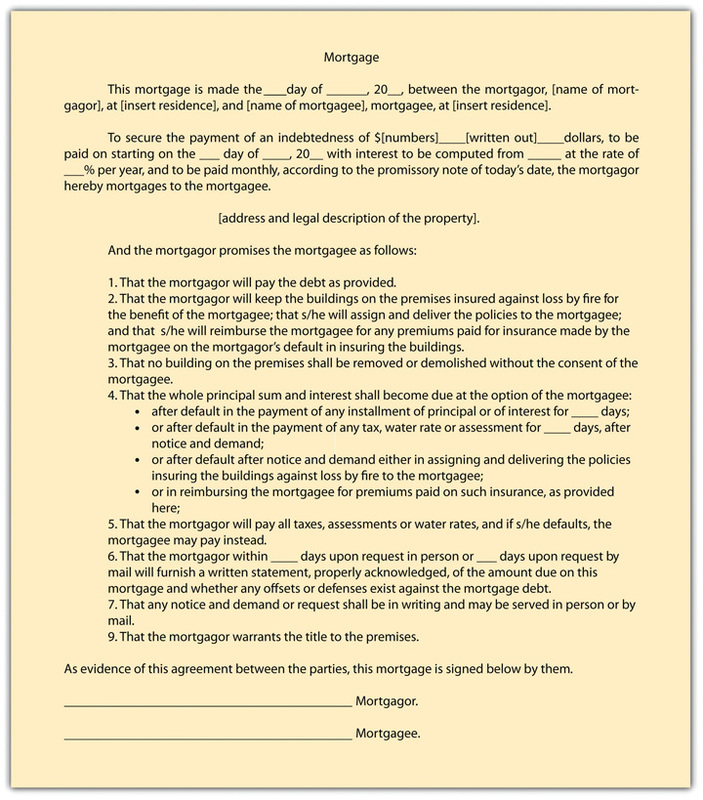 A sample mortgage form is presented in Figure 12.2 "Sample Mortgage Form". You may recall from Chapter 11 "Secured Transactions and Suretyship" how important it is for a creditor to perfect its secured interest in the goods put up as collateral. Absent perfection, the creditor stands a chance of losing out to another creditor who took its interest in the goods subsequent to the first creditor. The same problem is presented in real property security: the mortgagee wants to make sure it has first claim on the property in case the mortgagor (debtor) defaults. The fixture-filing provision in Article 9 of the UCC is one exception to the general rule. As noted in Chapter 11 "Secured Transactions and Suretyship", the UCC gives priority to purchase-money security interests in fixtures if certain requirements are met. Unless they live in the home for twenty-five or thirty years, the mortgagors usually pay off the mortgage when the property is sold. Occasionally, mortgages are paid off in order to refinance. If the mortgage was taken out at a time of high interest rates and rates later drop, the homeowner might want to obtain a new mortgage at the lower rates. In many mortgages, however, this entails extra closing costs and penalties for prepaying the original mortgage. Whatever the reason, when a mortgage is paid off, the discharge should be recorded. This is accomplished by giving the mortgagor a copy of, and filing a copy of, a Satisfaction of Mortgage document. In the Paul H. Cherry v. Chase Manhattan Mortgage Group case (Section 12.4 "Cases"), the bank mistakenly filed the Satisfaction of Mortgage document, later discovered its mistake, retracted the satisfaction, accelerated the loan because the mortgagor stopped making payments (the bank, seeing no record of an outstanding mortgage, refused to accept payments), and then tried to foreclose on the mortgage, meanwhile having lost the note and mortgage besides. The buyer need not assume the mortgage. 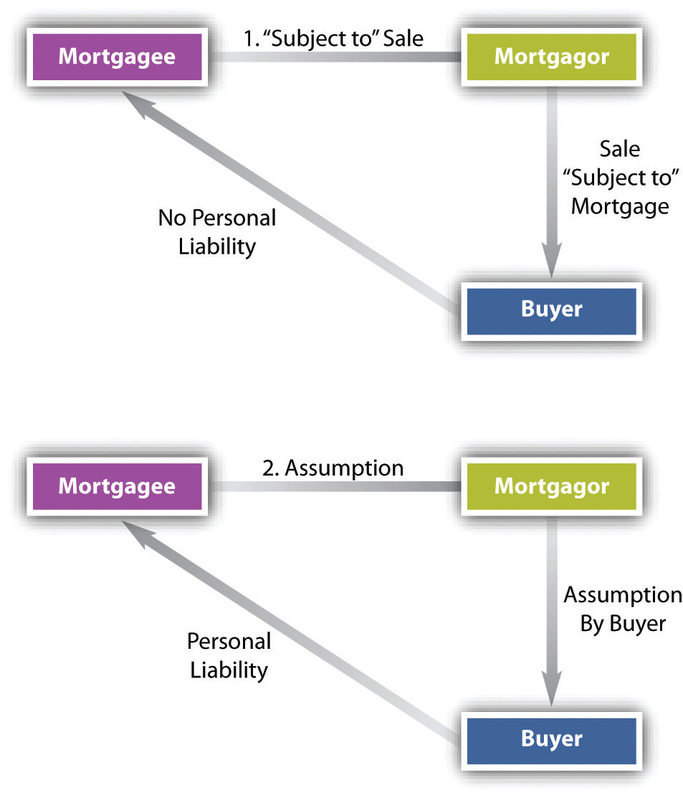 If the buyer purchases the property without agreeing to be personally liable, this is a sale “subject to” the mortgage (see Figure 12.3 "“Subject to” Sales versus Assumption"). In the event of the seller’s subsequent default, the bank can foreclose the mortgage and sell the property that the buyer has purchased, but the buyer is not liable for any deficiency. The third method of terminating the mortgage is by foreclosure when a mortgagor defaults. Even after default, the mortgagor has the right to exercise his equity of redemption—that is, to redeem the property by paying the principal and interest in full. If he does not, the mortgagee may foreclose the equity of redemption. Although strict foreclosure is used occasionally, in most cases the mortgagee forecloses by one of two types of sale (see Figure 12.4 "Foreclosure"). Alpha Imperial Building, LLC v. Schnitzer Family Investment, LLC, Section 12.4 "Cases", discusses several issues involving deeds of trust. Understand the nonconsensual liens issued by courts—attachment liens and judgment liens—and how they are created. Recognize other types of nonconsensual liens: mechanic’s lien, possessory lien, and tax lien. The security arrangements discussed so far—security interests, suretyship, mortgages—are all obtained by the creditor with the debtor’s consent. A creditor may obtain certain liens without the debtor’s consent. Some nonconsensual liens are issued by courts. An attachment lienA judicial lien imposed to preserve property during litigation. is ordered against a person’s property—real or personal—to prevent him from disposing of it during a lawsuit. To obtain an attachment lien, the plaintiff must show that the defendant likely will dispose of or hide his property; if the court agrees with the plaintiff, she must post a bond and the court will issue a writ of attachment to the sheriff, directing the sheriff to seize the property. Attachments of real property should be recorded. Should the plaintiff win her suit, the court issues a writ of execution, directing the sheriff to sell the property to satisfy the judgment. A judgment lienA lien imposed to secure payment of a judgment owing. may be issued when a plaintiff wins a judgment in court if an attachment lien has not already been issued. Like the attachment lien, it provides a method by which the defendant’s property may be seized and sold. The most common nonconsensual lien on real estate is the mechanic’s lienA claim allowed to one who furnishes labor, services, or materials to improve property.. A mechanic’s lien can be obtained by one who furnishes labor, services, or materials to improve real estate: this is statutory, and the statute must be carefully followed. The “mechanic” here is one who works with his or her hands, not specifically one who works on machines. An automobile mechanic could not obtain a mechanic’s lien on a customer’s house to secure payment of work he did on her car. (The lien to which the automobile mechanic is entitled is a “possessory lien” or “artisan’s lien,” considered in Section 12.3.3 "Possessory Lien") To qualify for a mechanic’s lien, the claimant must file a sworn statement describing the work done, the contract made, or the materials furnished that permanently improved the real estate. A particularly difficult problem crops up when the owner has paid the contractor, who in turn fails to pay his subcontractors. 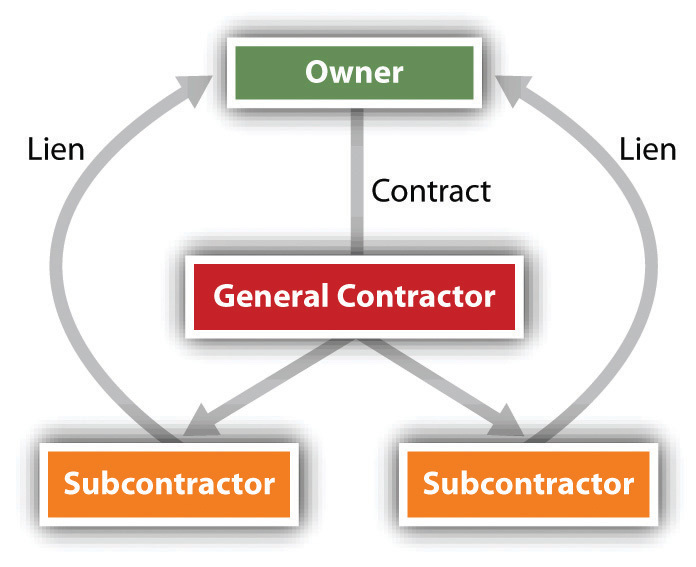 In many states, the subcontractors can file a lien on the owner’s property, thus forcing the owner to pay them (see Figure 12.5 "Subcontractors’ Lien")—and maybe twice. To protect themselves, owners can demand a sworn statement from general contractors listing the subcontractors used on the job, and from them, owners can obtain a waiver of lien rights before paying the general contractor. Anyone claiming a lien against real estate must record a lien statement stating the amount due and the nature of the improvement. The lienor has a specified period of time (e.g., ninety days) to file from the time the work is finished. Recording as such does not give the lienor an automatic right to the property if the debt remains unpaid. All states specify a limited period of time, usually one year, within which the claimant must file suit to enforce the lien. Only if the court decides the lien is valid may the property be sold to satisfy the debt. Difficult questions sometimes arise when a lien is filed against a landlord’s property as a result of improvements and services provided to a tenant, as discussed in F & D Elec. Contractors, Inc. v. Powder Coaters, Inc., Section 12.4 "Cases". A mechanic’s lien represents a special risk to the purchaser of real estate or to lenders who wish to take a mortgage. In most states, the mechanic’s lien is given priority not from the date when the lien is recorded but from an earlier date—either the date the contractor was hired or the date construction began. Thus a purchaser or lender might lose priority to a creditor with a mechanic’s lien who filed after the sale or mortgage. A practical solution to this problem is to hold back part of the funds (purchase price or loan) or place them in escrow until the period for recording liens has expired. The most common nonconsensual lien on personal property (not real estate) is the possessory lienLien imposed by one who has possession of goods to secure payment for improvements to them.. This is the right to continue to keep the goods on which work has been performed or for which materials have been supplied until the owner pays for the labor or materials. The possessory lien arises both under common law and under a variety of statutes. Because it is nonconsensual, the possessory lien is not covered by Article 9 of the UCC, which is restricted to consensual security interests. Nor is it governed by the law of mechanic’s liens, which are nonpossessory and relate only to work done to improve real property. The common-law rule is that anyone who, under an express or implied contract, adds value to another’s chattel (personal property) by labor, skill, or materials has a possessory lien for the value of the services. Moreover, the lienholder may keep the chattel until her services are paid. For example, the dry cleaner shop is not going to release the wool jacket that you took in for cleaning unless you make satisfactory arrangements to pay for it, and the chain saw store won’t let you take the chain saw that you brought in for a tune-up until you pay for the labor and materials for the tune-up. An important statutory lien is the federal tax lienA lien imposed by the government to secure payment of taxes owing.. Once the government assesses a tax, the amount due constitutes a lien on the owner’s property, whether real or personal. Until it is filed in the appropriate state office, others take priority, including purchasers, mechanics’ lienors, judgment lien creditors, and holders of security interests. But once filed, the tax lien takes priority over all subsequently arising liens. Federal law exempts some property from the tax lien; for example, unemployment benefits, books and tools of a trade, workers’ compensation, judgments for support of minor children, minimum amounts of wages and salary, personal effects, furniture, fuel, and provisions are exempt. Local governments also can assess liens against real estate for failure to pay real estate taxes. After some period of time, the real estate may be sold to satisfy the tax amounts owing. 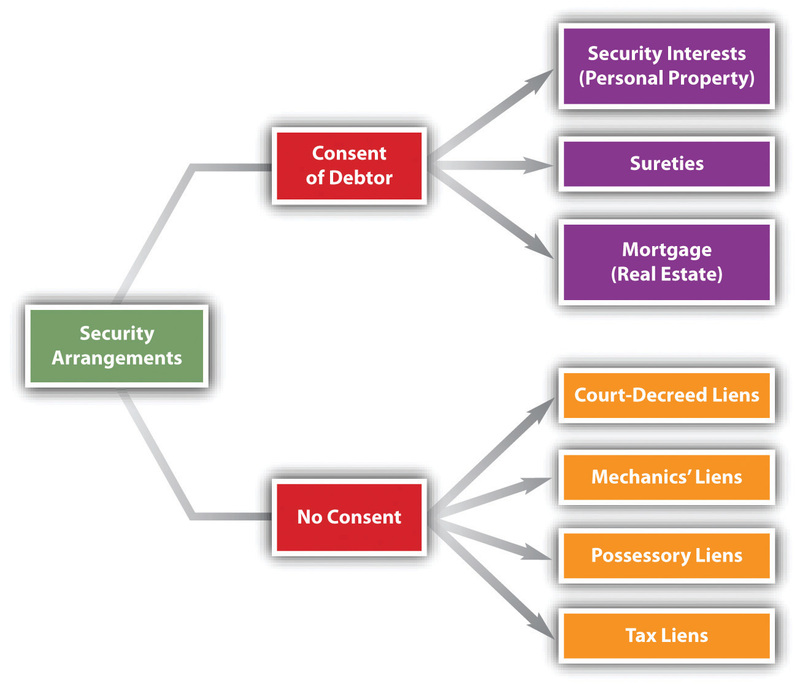 There are four types of nonconsensual liens: (1) court-decreed liens are attachment liens, which prevent a person from disposing of assets pending a lawsuit, and judgment liens, which allow the prevailing party in a lawsuit to take property belonging to the debtor to satisfy the judgment; (2) mechanics’ liens are authorized by statute, giving a person who has provided labor or material to a landowner the right to sell the property to get paid; (3) possessory liens on personal property allow one in possession of goods to keep them to satisfy a claim for work done or storage of them; and (4) tax liens are enforced by the government to satisfy outstanding tax liabilities and may be assessed against real or personal property. The mortgagor’s interests are protected in a judicial foreclosure by a court’s oversight of the process; how is the mortgagor’s interest protected when a deed of trust is used? Why is the deed of trust becoming increasingly popular? What is the rationale for the common-law possessory lien? Mike Mechanic repaired Alice Ace’s automobile in his shop, but Alice didn’t have enough money to pay for the repairs. May Mike have a mechanic’s lien on the car? A possessory lien? Why does federal law exempt unemployment benefits, books and tools of a trade, workers’ compensation, minimum amounts of wages and salary, personal effects, furniture, fuel, and other such items from the sweep of a tax lien?